Not many Pinellas County pest control companies are licensed and insured professionals, specializing in nuisance animal removal. Make sure that you hire a competent expert for your Pinellas County exterminator of nuisance wildlife. At Nuisance Wildlife Removal, we will be courteous and friendly and take the time to answer your questions. Give our Pinellas County trappers at Nuisance Wildlife Removal a call, and we will listen to your problem, and make an appointment to perform an inspection. Florida is full of wildlife, including snakes, squirrels, raccoons, opossums, and more. 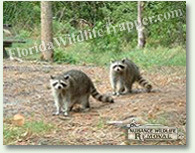 You will need professional Pinellas County snake removal or raccoon control if you can't trap the wild animal on your own and perform full repairs and prevention to keep pests out for good. We perform the repairs and decontamination if necessary. Rats and mice love to live in attics, and can chew wires or leave droppings. In fact Pinellas County wildlife frequently enter homes, and it takes a pest management company to remove them. We are Pinellas County wildlife management experts, and are familiar with all the pest animals, including all species of Florida snakes and bats. We at Nuisance Wildlife Removal are the best among Pinellas County nuisance wildlife companies and can solve all animal damage issues. Our wildlife operators are skilled at bird control and bat removal, and would be happy to serve your Pinellas County bat control or pigeon and bird control needs with a professional solution. Opossums, skunks, moles, and other animals that can damage your lawn - we are the exterminators who can capture and remove them. Our professional pest management of wildlife and animals can solve all of your Pinellas County animal control and capture needs. Give us a call at 727-302-8030 for a price quote and more information. You are not alone. Many people in Pinellas County have had this problem, specifically with Roof Rats. They are the most common and disease-ridden pests in the state of Florida. Their long, scaly, black tails and their sleek body identify them. Along with destroying your home, Roof Rats are host to a plethora of diseases. If a rat bites a person, they could contract Rat Bite Fever, which shows symptoms of the flu, and could be fatal. Hantavirus is contracted by stirring up the urine and droppings of a rat, resulting in fever, body aches, chills, and stomach problems. If the urine enters a minor cut, a person could contract Weil's Disease, resulting in fever and kidney failure. Rats are also known to carry lime disease, which is contracted by tick bites, causing skin lesions, fever, and headaches. Roof Rats can produce a litter once or twice a month, with about eight to nine pups each time. Roof Rats are abundant and the problems associated with them are serious, and that is why Nuisance Wildlife Removal is here to help you. The method of rodenticide is not usually the safest way to deal with this problem, considering the danger of rats dying in the walls. At Nuisance Wildlife Removal, we first provide an exclusion inspection. We will completely inspect the interior and exterior of the structure, followed by a full estimate with an explanation of the conditions of the problem. All openings will then be sealed to prevent any further rodent infestations. Traps are set, and the rodents are removed leaving you with a rat-free, disease-free, and odor-free home.